Air Deccan website is now updated with their initial schedule and booking have opened. Bookings can now be made on Air Deccan website. Bookings are being accepted till end of March only and tickets cost about INR 1500 one way (Couldn't locate a single date with cheaper tickets- the famed Rs 1 tickets). There is no fee for seat selection and no convenience fee. 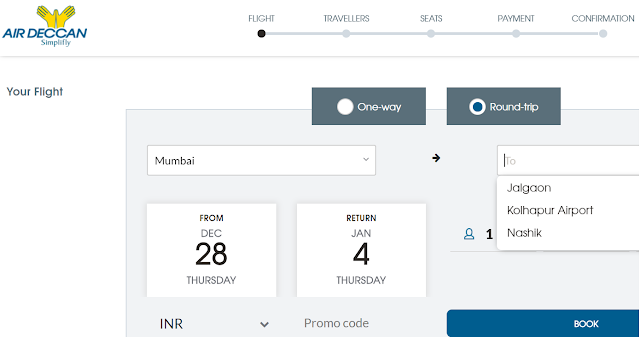 Air Deccan is still not showing as an option on MakeMytrip or other travel sites. Happy flying. Aircraft Air Deccan is using is a 19 seater Beechcraft 1900D- a super small twin engine turbo prop. At 1500 a seat, factoring Rs 500 for taxes, revenue per flight is just about 19000 Rs at full occupancy.